Do you ever have that feeling that everyone has life figured out except you? Today I was thinking of that quote, "the grass is always greener on the other side". Isn't that the truth! God has been showing me lately that the grass isn't always greener on the other side. So often in life it seems like everyone has it all together except for me. He's shown me that everyone is struggling with something. We're bound to have struggles as long as we're on this earth. So often we strive for perfection, but perfection is only available in Heaven! I've felt convicted about putting on the happy facade myself. Generally I'm a smiley, happy person; I even tend to wear a smile when I'm not-so-happy or just downright upset. A smile works as a mask at times. Maybe God wants me to share my struggles more often. Now I'm not talking about totally unloading my personal life trials on the random person behind me in line at Walmart! By sharing the struggles in my life and what God is teaching me through them, I may be able to help other people who have the same struggles. The key is following the Holy Spirit's lead when He prompts me to share. Just some thoughts... It's not that I fake a smile on purpose, it's my default. When I am feeling really down, I try to remind myself where God has taken me from. He never gave up on me when I was completely running in the opposite direction and had no regard for Him. That's enough to make a person smile. I have to remind myself the worst day as a Christian is infinitely better than any day I had before I knew Jesus (see Psalm 84:10). Now I have hope and purpose. Before Jesus saved me, I had nothing. What or who encourages you on the hard days? This week, I started training for the half marathon in May. While training for this race, I'm focusing on training with more intensity, more purposeful running and not having as much "junk mileage". Even for the past full marathons, I have really lacked hill training and tempo runs. Fargo is a very flat course, but hill training can do wonders for any race. SAT: Long Run - the longest run I will do is only 2 hours long! That's definitely a perk compared to the full marathon's 20-milers. It feels good to be back in a semi-structured "training mode"! Compression socks are probably the most awesome piece of running gear ever. 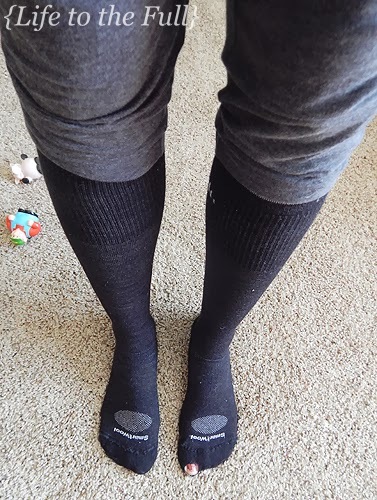 I wear them too much: some may think I'm a ninja. Clearly my SmartWool socks are my super-favorite because of the annoyingly large hole in the toe :( Also - notice a couple of E's farming birthday presents creeping in the picture! Do you have any races planned for 2014? What is your favorite piece of workout gear? Of course I have a few random pictures to share! It's been another joyously cold week, but I'm looking on the bright side. Only 10 weeks til the Fargo Half Marathon, which means 10 weeks until it's MAY and possibly even summer-like weather! I've been baking again... Leo has been requesting cookie bars lately, so I made him a "healthier" version of Six-Layer bars. 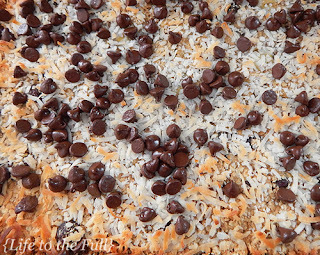 These are basically just peanut butter and banana granola bars with coconut and chocolate chips on top. That sure beats the sweetened condensed milk recipe! I love these boys. I can't believe we have a one-year-old now! (Warning: Don't read this if you are a hair stylist) I cut my own hair last week and it worked out fairly well. 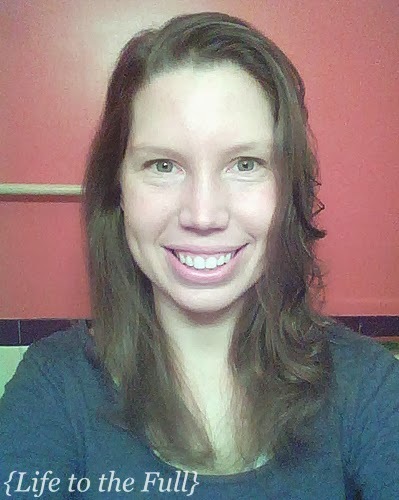 Thankfully, curly/wavy hair is forgiving. I followed this post: 5 DIY haircuts to try today . Obviously I'm not a hair-cutting expert, but it saves $$ when all I want is a slight trim anyways. Someone is on the prowl for trouble! Linking up at Serving Joyfully and Cozy Reading Spot. You are so right about everyone having troubles. I even misspelled everyone the first time I typed it. ~smile~ I started feeling better about myself when I found that others struggled, too. Funny how I thought I was the only one. I think it's because we put up such a facade in Christian circles. Walls come down when we're honest. That is so true, Laura. When we are honest with others, God gives us the ability to comfort them in their struggles, too. Sometimes their struggles aren't so different from our own! "I have to remind myself the worst day as a Christian is infinitely better than any day I had before I knew Jesus"
This post came at the perfect time! I am definitely guilty of wearing the smiley mask when I am worried. I need to turn my worries over to the Lord and know he has a plan. My over the top Type A planner personality gets in the way of that. It's just something I need to work on more often. Thank you! I have that Type-A personality, too, and it is so hard for me to accept that life is out of my "control"! Even this morning I have had to remind myself of this... I need to give those cares and worries to God the second they come up in my heart. Thanks for stopping by, Lauren! Yes, we all have troubles, and it's important to remember that. It is so hard to wait for God to respond (in our way of thinking of response) to our prayers, especially when we want a baby! I'm also gearing up for a half (next feb) but I have to wait for my baby to arrive safely to really train. Thank you for stopping by, Marissa, and congratulations in advance on your baby :) Being patient is such a struggle for me, but since patience is a fruit of the Spirit, it's worth these struggles to shape my character!